Stick your phone charger into the flames of a charcoal stove? You might feel like it in your moments of frustration, but never before has it been a productive action. 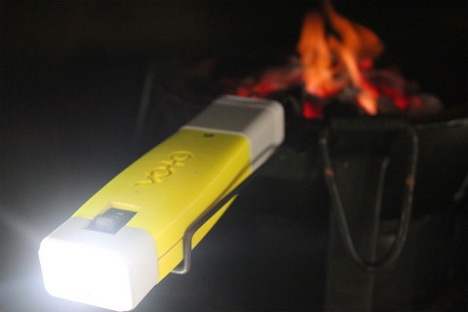 Now, however, a company called Point Source Power has invented a low-cost device called VOTO that gains power directly from fire. A fire-activated fuel cell lives within the VOTO and builds up power while the coal stove or other source of fire does its thing, cooking your meal or whatever. The rest of the device sticks out and the phone charging cord dangles away from the fire. Oxygen converts the burning carbon and hydrogen into electricity. 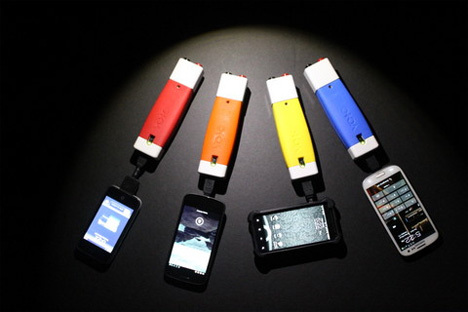 As an added bonus, the device also incorporates a small flashlight. There are some other similar devices on the market, but the VOTO is the only one we’ve seen that can be used with your existing camp stove or grill. The gadget would be of amazing benefit for people living in third-world countries who have fire and cell phones, but not reliable electricity with which to charge those phones.